It's really happening, MSTies. Our heroes from the Satellite of Love are coming to National Geographic in April! 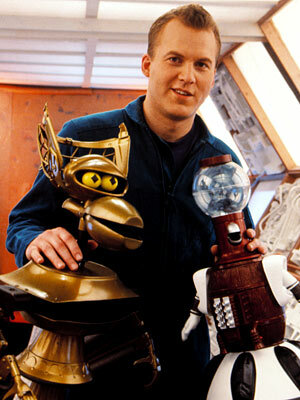 It's not an April Fool's trick: the crew of MST3k will return on Tuesday, April 1st. One of the greatest cult shows of the 1990s, Mystery Science Theater 3000, starred Michael J. Nelson, Kevin Murphy (Tom Servo) and Bill Corbett (Crow T. Robot) in its last incarnation. Today the three continue their riffing of B-movies, classics, blockbusters, and shorts at Rifftrax.com. But this April Fool's Day, Mike, Bill, and Kevin will return to our televisions for the first time since 1999! The National Geographic channel will feature the riffers on a new special, Total Riff Off. According to TODAY, "they'll be cracking wise over three different one-hour episodes featuring classic clips from National Geographic shows, all in the wittiest-guys-in-the-room format that their fans know well." Tune in for the first episode, "Killer Shrimp N' Friends", at 8:00 PM on NGC! Break out the MST3k GIFs, it's time to celebrate! Are you there, God? It's me, a MSTie who still hasn't gotten over the show's cancellation in 1999. For once, I understand Big McLargehuge. Well, see you guys on April 1st!